Brief Synopsis – A Pakistani comedian living in Chicago meets and falls in love with a girl but is afraid to have her meet his family because they are staunch traditionalists. My Take on it – This is a film that I’ve been hearing about for the last couple of weeks and was really interested in finding out what it was all about. Usually with films that get so much hype, those feeling ruin the expected outcome because you think it will be so much better than it is. This is a film that is able to reach that high level of expectation. The story is great and the fact that it is largely based on truth helps make it so enjoyable to watch. The way that they mix the ideas of the struggles of an up and coming comedian along with relationship issues that people might have due to ethnic traditions. Kamiel Najani uses his stand up routine to tell us such a fascinating, yet awkward story. Nanjani is hilarious in almost every scene because his demeanor is so perfect for this kind of role. The story is both enjoyable and heartwarming at the same time because the characters are so loveable. Love the chemistry and energy hat Nanjani has with his co-stars. 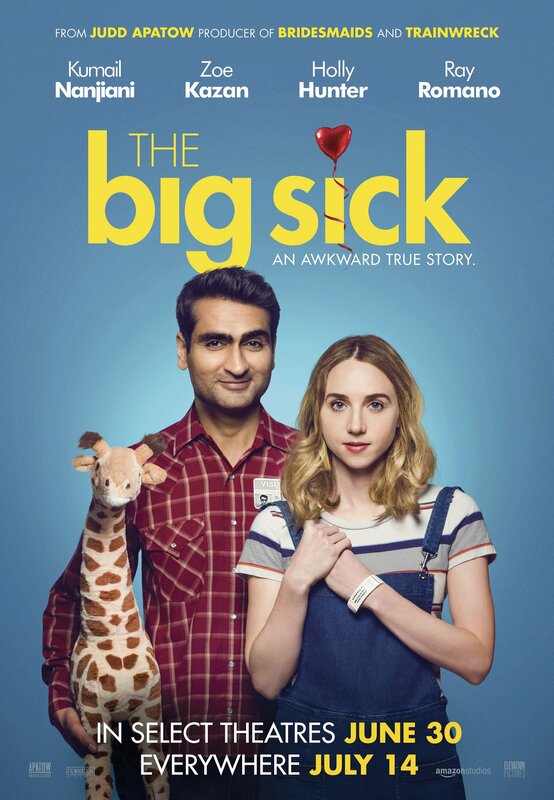 He and Zoe Kazan seem as if they could conceivably really be in a relations; Ray Romano and Holly Hunter have an awkward kind of chemistry with Nanjani but that still works in spite of that. Loved the bickering between the couple. This is one of the best romantic comedies that has come along in years due to the genuine feeling that it gives off. I really hope that the success of this film helps Nanjani break out into more starring roles. Bottom Line – Such a pleasant surprise. This film tells a great story (based somewhat on truth) about the difficulties of being a stand up comedian along with the typical relationship problems people encounter due to their ethnic traditions. Nanjani is hilarious here and uses his stand up idea to make the story enjoyable and heartwarming the entire time. His chemistry with Kazan is great and you really feel as if they are in a real relationship. Romano and hunter are great as Kazan’s awkward parents who form a love-hate relationship with Nanjani. One of the best rom-com’s to come around in a long time because it feels so genuine. Highly Recommended! Agree with you on this one. It’s also one of my top movies for 2017. Wonderfully well done by all involved. Writing, acting, direction. they say that it’s not easy to play yourself on screen – but Nanjani does an expert job of it. I hope he gets the awards season credit he deserves. He co-wrote the screenplay with his wife Emily Gordon – played on screen by Zoe Kazan. I think some minor liberties were taken with the absolute “truth” about every detail of the “true” story – especially with some of his interactions with her parents (beautifully played by Ray Romano and Holly Hunter) – but the essence of their story was on the screen. It is -a rather offbeat romantic comedy – in the truest sense – since it follows no formula but it’s own. Boy meets girl, they break up, girl goes into coma, boy hovers around with her parents. You really can’t make this stuff up. As to the bidding war and Netflix – Netflix is fully capable of marketing something as a feature – they did it with “Beasts of No Nation”, but Amazon is a stronger hand at it – as seen by their big Oscar campaign last year (and success) with “Manchester By The Sea” and they have a number of strong contenders this year as well, The Big Sick amongst them. I’ll be buying the DVD and watching it again. I already have the one sheet. Next time I see Zoe Kazan on Broadway (I know her Dad, Nick), I’ll bring it along for an autograph.